It's time for a new summer project. In case you haven't been following along, I advise the Edgerton Center Summer Engineering Workshop, which is a relatively ad-hoc group of MIT and HS students bent on producing some of the most unarguably cool vehicles on campus / in the world. It's part research, part education, and part fun, and anyone who has a problem with that can go away. Our fleet currently consists of the DIY Segway, a homemade version of Dean Kamen's self-balancing scooter, and the Cap Kart, a pretty sophisticated electric go-kart with a 110F ultracapacitor regen/boost. 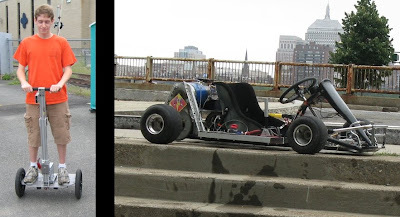 The DIY Segway (2007) and the Cap Kart (2008). These vehicles, although certainly a lot of fun, are not really very practical. One is inherently unstable and the other weighs 350lbs and has a ground clearance of 3/4"; neither is a sort-of everyday ride. Inspired by this modified Razor scooter made by Charles Guan, we've decided to add a light vehicle to the fleet. 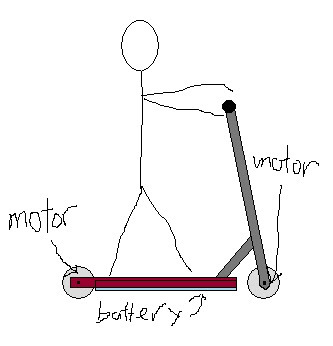 I was originally thinking that a simple DC motor and belt drive with excessive amounts of torque would suffice, but apparently I'm boring and unimaginative. So instead, the team has shifted to a new design. Base: Razor Spark. Really we are only using the front folding / steering thrust bearing mechanism. The wheels, handlebar, and deck will be custom. Motors: Completely custom in-wheel hub motors (x2). They'll be a bit bigger than normal razor scooter wheels, but not much. The space savings elsewhere will more than make up for it. Basing our design very closely on the one built and tested by Charles Guan (more details). It's a 12-slot, 14-pole brushless DC motor, sometimes called an LRK motor, which provides relatively high torque and low ripple due to the strange slot/pole number. Deck: Custom aluminum with battery tray underneath. Control: Well, it'll probably start off with cheap model airplace ESCs, but the ultimate goal is to have a real torque-based controller that can do regenerative braking. That will take some effort. 2.009 Green Team Final Project, "Elika"
Like any good engineering project, I started in CAD. 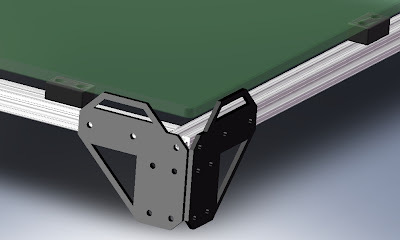 I drew up some cool-looking corner brackets that would also hold the glass, which sits on rubber bumpers, in place. Here's the "before" shot. The corners were cut on a water jet. All together, complete with $20 folding chairs. Now I have a place to eat my cereal in the morning!